USAF Band Max Impact Live! 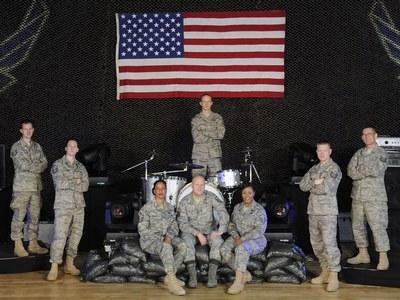 Join us this week as we welcome the United States Air Force premier rock band, Max Impact. Commissioned in 2005, the band's eight members perform exciting original music, rock, country, patriotic favorites as well as classic and current pop hits. In addition to entertaining military and civilian audiences in the United States, Max Impact has thrilled troops with their hard-rocking energy and amazing musical versatility at forward deployed locations including Iraq and Afghanistan. We will talk to Max Impact about their upcoming schedule, get a behind the scenes look at their music, feature their latest songs including their original hits "Locked and Loaded" and "Send Me". Also we will ask them to share their efforts to support the troops. Please be sure to visit Max Impact at http://www.facebook.com/usafmaximpact and spread the word. Fans are welcome to call in and chat live with Max Impact during the show. If you would like to participate in the live chat during the show, you must sign up on the show site first and then log in during the show. More great music for a really great cause! And as always we will give shout outs to our deployed military listeners. Be sure to join us, Sunday May 6th 2012 at 4:00 PM EST! Our message to the troops....WE do what we do, because YOU do what you do.